"I regularly back up my messages of my iPhone 6s Plus, running iOS 10.3 for now, to the iCloud and I was of the impression all of my messages are backed up. More recently, I received a lot of spamming message from unknown source and I went ahead deleting the messages. To my shock, it dawned on me that I accidently deleted customer mailing addresses and other business specific information, text messages and details. I chose to restore from iCloud but it did not have option to restore deleted text messages. What should I do to get back my deleted text messages?" Deleting messages inadvertently that is crucial and important for you is quite a common scenario. Before, you go on a panic-mode it is good to realize that there are many tools and technologies available for you to help retrieve the messages that are deleted so there is no need to worry at all. 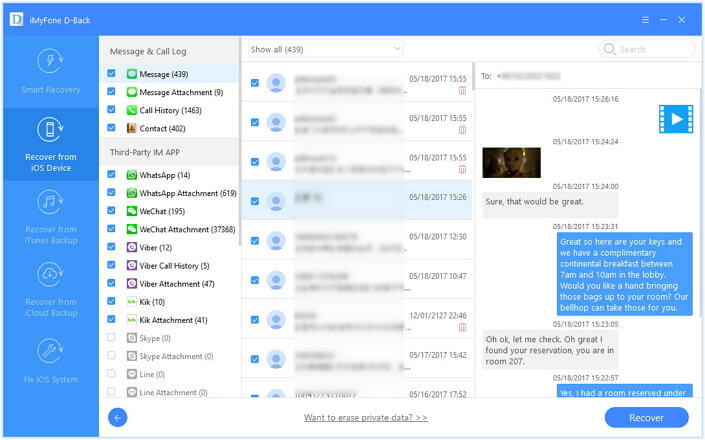 We will introduce a useful software which provides you 3 ways to restore messages. All the three methods work for iPhone/iPad/iPod touch running the latest iOS 10.3 and earlier versions. However, it is absolutely important that you choose over the right kind of recovering tool that would safeguard your phone’s security and also helps with recovering the deleted message without any hassles. It is possible to Restore deleted text messages iphone by way of using iMyFone D-Back iPhone message recovery or iMyFone iPhone message recovery for Mac, the easy to use and efficient tool that enables you to retrieve the deleted message such as Text messages, Whatsapp messages, Skype messages, Wechat messages, Kik messages in just few steps. Supports all the iOS device such as iPhone 7/SE/6S Plus/6S/6 Plus/6/5S/5/4S/4, iPad and iPod touch. 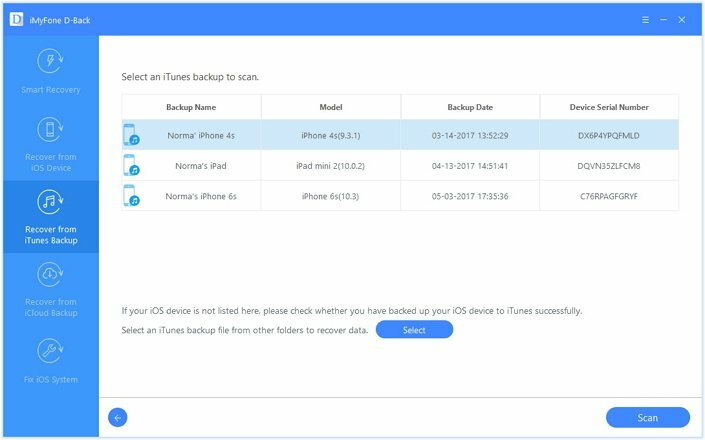 Following we will introduce how to restore iPhone texts from iTunes Backup, iCloud Backup, or directly from iPhone using iMyFone D-Back. 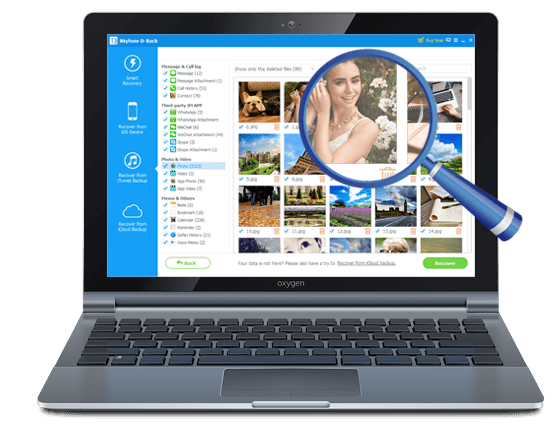 Download the iMyFone D-Back software and install in your system. You then need to run the program and select, “Recover from iTunes Backup ” option. You need to select the “Message” from the Message and Calls option. After this, you need to choose the iTunes Backup file from which you want to recover messages. You then need to go for the “Scan” option. Once the scanning process is over, you need to preview the messages and pick out the ones that you want to retrieve. You can then choose over the output format, whether html or text. 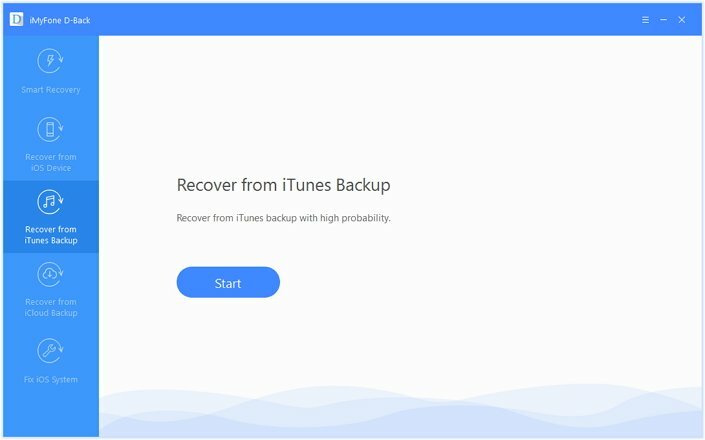 Click on the “Recover” button and the message would be back to the iTune backup. You need to install the iMyFone D-Back to your system and have the iOS data recovery running in your computer. 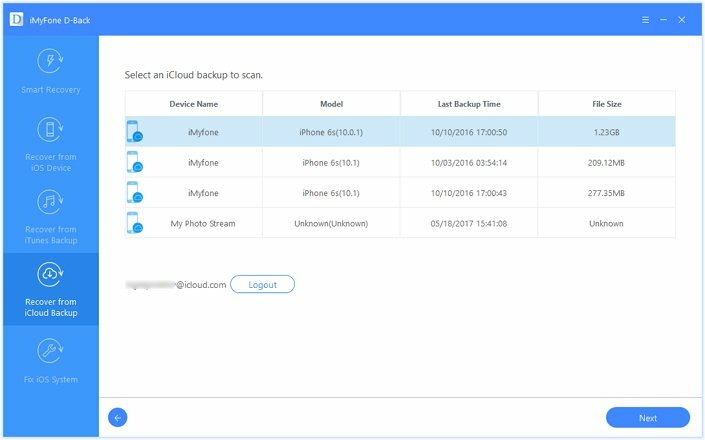 Choose Recover frim iCloud Backup and select messages in the file options. Log into your Apple account using your Apple ID and password. After logging into the platform, the backup history will be provided before you to choose from. It will take a few minutes to download the messages from iCloud Backup. Once the scan is finished, You will be able to view all the documents that you have in the table. And you can choose the message you want to click on the “Recover” option. Your lost files are back! iMyFone has the capability to recover deleted messages directly from that of the iOS device. All that you need to do is to choose the option “Recover from iOS device” and follow few steps thereon. iMyFone D-Back or iMyFone D-Back for Mac is the best recovery tool that you can get to retrieve any important data, file, text messages in whatever format it may be.